Welcome to Buffalo Ridge Regional Transit! Buffalo Ridge Regional Transit is a coordinated effort by the four public transportation systems in Southwestern Minnesota to increase access to needed good and services throughout Murray, Nobles, Pipestone, and Rock Counties. 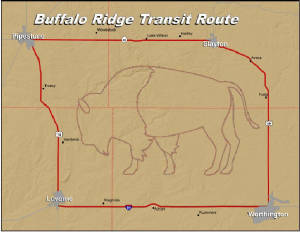 What is Buffalo Ridge Regional Transit (BRRT) Route Services? Each county operates an accessible vehicle to provide access to goods and services throughout Southwestern Minnesota. How much does it Cost to Ride on the BRRT Route? Who can Ride on the BRRT Route? Anyone can ride the bus! People of all ages and any income level who are unable to obtain a ride or unable to use other transportation modes can use this service. Students, adults, and elderly residents can use the bus to get to activities, medical, dental, business appointments and more! The BRRT Route Service is for anyone who is in need of transportation. It is for anyone who has trouble getting to doctor or business appointments, local shopping needs, or other social and business events. The BRRT Route Service is for anyone who does not want to impose on friends, relatives, or neighbors for a ride. The BRRT Route Service is available for anyone who doesn’t have anyone to call for a ride!